Forsway, a provider of solutions that tap satellite and existing terrestrial technologies to enable cost-efficient broadband, will showcase their Forsway Xtend complete ecosystem for providing hybrid connectivity at CABSAT 2019, March 12th-14th, at Stand 713, Hall 7, Dubai World Trade Center. 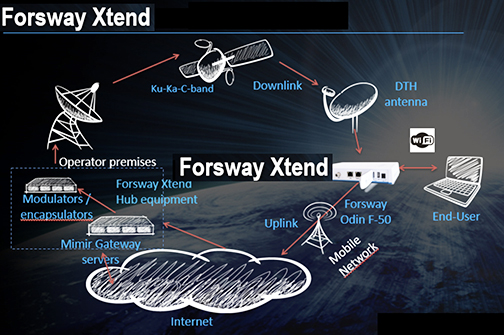 Forsway Xtend is a complete ecosystem that combines satellite with terrestrial networks enabling service providers to tap unused bandwidth. Operators can rapidly deliver cost-efficient broadband internet services to regions lacking reliable access, suffering from under-performing mobile data and ADSL services. On-site solutions and demonstrations at CABSAT will also showcase Forsway’s Xtend Hub including the robust Mimir Gateway operator terminal, and the high performance Odin F-50 hybrid satellite router. Employing VNO support, Forsway technology enables service providers with multiple business opportunities to sell both accounts and dedicated bandwidth as well as provides rapid service deployment and eliminates the need for additional infrastructure, thereby reducing the total cost of ownership. The company delivers an innovative alternative to under-performing mobile data and ADSL services and, according to the company, their solutions outperform VSAT cost and QoE using terrestrial return channel and satellite forward link. Broadband access will drive growth and prosperity in rural regions; however, cost-efficient broadband solutions are needed to connect hard-to-reach regions. Tapping internet over satellite, Forsway is providing innovative hybrid technology that uses considerably less satellite capacity than VSAT and reduces total cost of ownership for operators aiming to service under-served regions. Tobias Forsell, CEO, Forsway, said the company's complete Xtend offering to satellite operators, DTH providers, mobile network operators and telcos who strive to offer broadband also in areas where connectivity is an issue due to insufficient coverage or congestion and the firm's solution will be demonstrated. During CABSAT, the Forsway team will demo how the company has recently solved connectivity issues in Manila and Malaysia, Zimbabwe and Senegal, Assam and Abuja, together with leading satellite partners. 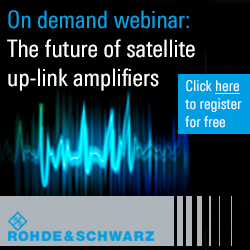 Plus, the firm will demonstrate how local communication services providers, ISP’s and systems integrators can benefit from investments in Forsway platforms carried out by leading satellite operators. Our satellite partners now offer managed services that can be locally re-sold to households, SME’s, government offices, health clinics, schools and NGO’s — even for customers located in under-serviced areas.